Of course, the readers of the Lancet were only too familiar with the ubiquity of the “medical-women question”, for it confronted them not only in their institutions and through popular culture, but in the pages of their medical journals as well. 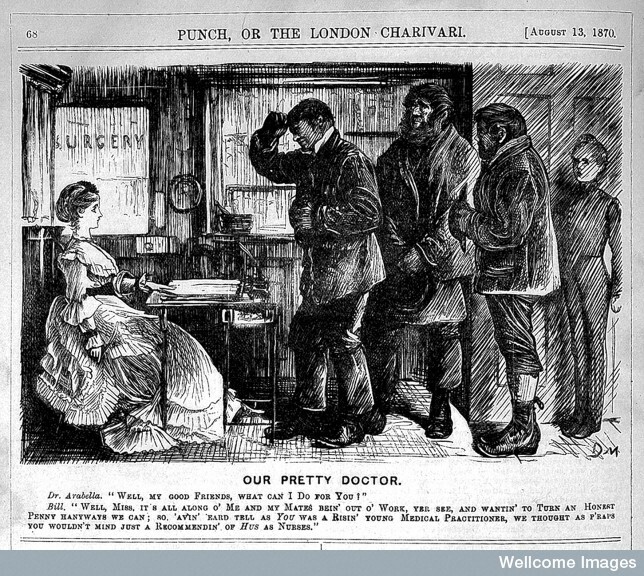 For the Lancet and its contemporaries were part of this wider debate over – or preoccupation with – the (im)propriety and (un)desirability of the female doctor: a new breed of practitioner who appeared on the British medical scene in the 1850s and 60s and had gained a foothold by the century’s close. Katherine Harrington over at the Royal Society has just put up a fantastic post on The Repository (the Royal Society’s History of Science Blog). Given the subject matter – large scale observation projects – and the citizen science bells that rings for us, she’s kindly let us re-post her work in its entirety here. For the original post, in-situ, head this way. As one of two new cataloguers joining the Library team (and occasionally to be spied vanishing into the stores to fetch readers’ requests), it has been a great pleasure starting work on a series of archive volumes rather cryptically titled ‘New Letter Books’. These 74 volumes record outgoing correspondence from the President, Officers and Assistant Secretaries, covering the period 1885-1931, and offer a detailed insight into the Society’s day-to-day operations whilst based at Burlington House. The correspondents involved vary tremendously and include Fellows, government officials, solicitors, bankers, publishers, printers, artists, engravers, engineers, plumbers and coalmen, to name but a few. The topics under discussion can be mind-boggling, from complaints regarding the unofficial use of the title FRS (by what appears to be a wig salesman no less) (NLB/4/1148), and neighbours at the Albany discarding items from their windows and blocking the Society’s gutters (NLB/1/472), to appeals to the Committee on Education bemoaning the neglect of elementary science in primary schools (NLB/4/187). Periodicals as a source base for research are endless fun. Victorian periodicals in particular are loaded with odd stories written by characters that you tend not to hear about that often in histories of science. When I was starting my research for the ConSciCom project – which focuses on the use of illustrations within 19th century natural history periodicals – I came across a periodical full of interesting people, images, and even an object!